The board of trustees in 2009 voted to support Mauna Kea as the site for the $1.4 billion Thirty Meter Telescope. 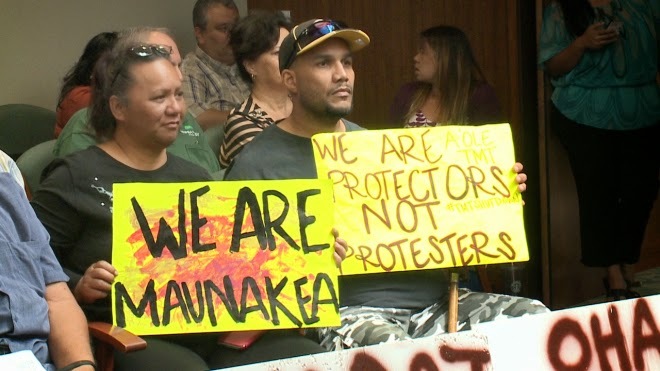 Amid mounting opposition after 31 protesters blocking the construction site were arrested earlier this month, the board held a special meeting Thursday to revisit its stance. Trustees could have voted to maintain support, oppose the project or rescind the previous position and take a neutral stance. After hours of listening to public comments for and against the project, some trustees said they were ready to vote for rescinding and opposing, but ultimately joined others to only rescind. "We have the opportunity to send a strong message that it is no longer business as usual for Hawaiians," said trustee Dan Ahuna. Trustee Peter Apo said rescinding without opposing would allow OHA to remain part of the discussion with the goal of eventual decommissioning of other telescopes already on the mountain. It's not clear what effect OHA's position will have on the project. The office is a public agency tasked with improving the well-being of Native Hawaiians. The office would receive a percentage of rent paid for the sublease of the land the University of Hawaii leases from the state. The company building the telescope earlier agreed to extend a construction moratorium. "We are naturally disappointed that the Office of Hawaiian Affairs has changed its position on the Thirty Meter Telescope project. However, we are by no means discouraged," TMT International Observatory Board Chairman Henry Yang said in a statement. "We must now redouble our commitment to respectfully continuing dialogue and engagement with OHA and all other stakeholders." And for an even less enlightening NYT article, see this one from last year where George Johnson brings in Galileo and connects the TMT issue to that of simply science versus religion. You can guess the content and tone of the article from the title: Seeking Stars, Finding Creationism.